Andrews, George Clinton. Diseases of the Skin: A Text-Book for Practitioners and Students. Philadelphia and London: W.B. Saunders, 1932. Andrews, George Clinton. 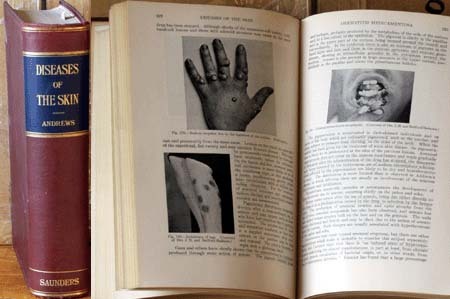 Diseases of the Skin: A Text-Book for Practitioners and Students, with 988 illustrations, index. Philadelphia and London: W.B. Saunders, 1932. Size: 10" x 7" x 2.5"
Condition: Excellent, tight binding, light pencil underlining on a few pages.